Our medium pipes all come with custom-made fitted cases with a velvet lining to safely enclose your soon to be treasured meerschaum pipe. All of these pipes are carved by hand by skilled artisans in the IK Meerschaum workshop in Eskisehir, Turkey from whole blocks of raw meerschaum. 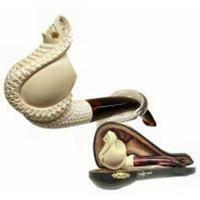 At this price you'd almost expect them to be made of reformed (aka pressed) meerschaum but since we import these pipes under our IK Meerschaum brank ourselves, we can pass the savings along to you! The medium pipes are just a touch smaller than a standard-sized pipe, with the exact sizing differing from pipe to pipe. If you are looking for a standard-sized pipe, you should try our Regular pipes.